AUGERS must inspire creativity. 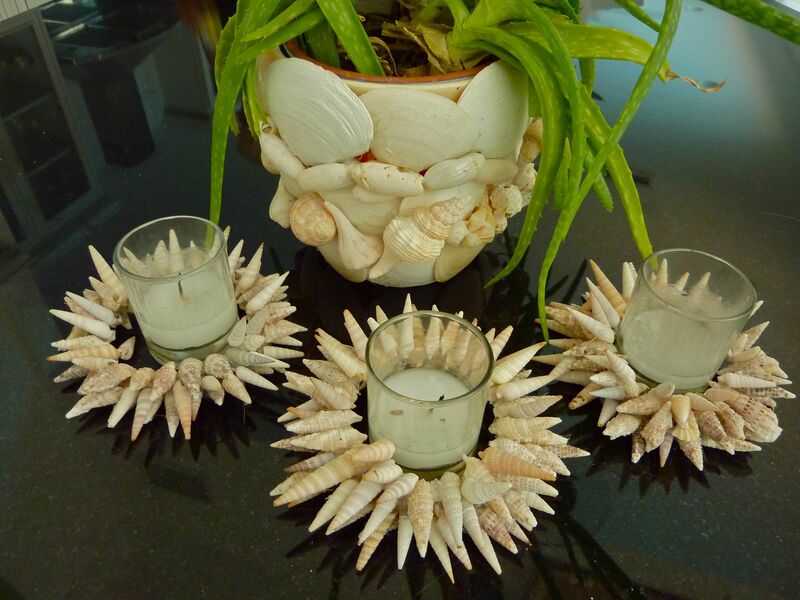 My friend Jane got inspired to make these auger rings to surround her candles……but wait…..there’s more. Jane only needs a little inspiration because her creative juices start flowing just looking at any type of shell she picks up on the beach. She picked up this box at a second hand store and covered the lid with PEN SHELLS and OLIVES for the handle. She uses hot glue to keep everything together and she says she rarely has problems with them falling off. If they do? She hot glues them right back on. Lots of people ask how they can display their shells. Did you ever think of making a mermaid picture? Me neither, but Jane did. She used WHELK casings for the mermaid’s hair and pen shells for her scales. Adorable! 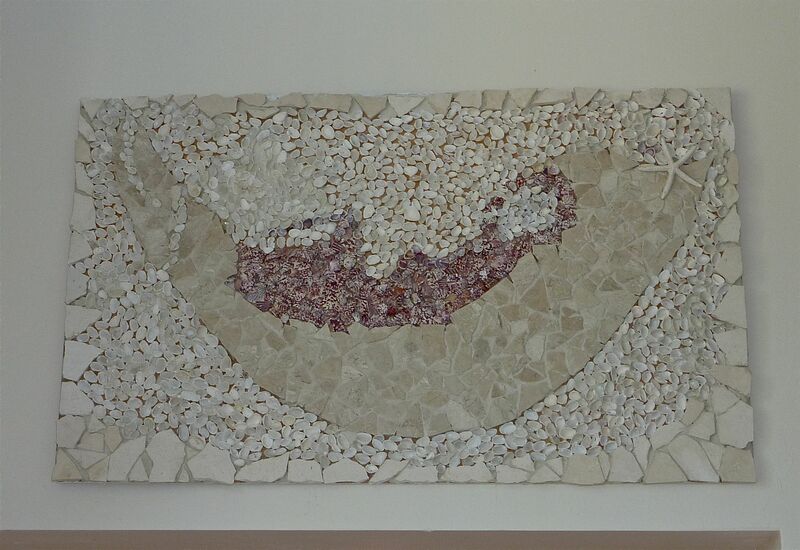 She designed left-over tile pieces in the shape of Sanibel and surrounded it with small white shells (mostly clam shells) and added bits and pieces of red CALICO SCALLOP shells where the red mangroves are around Tarpon Bay. 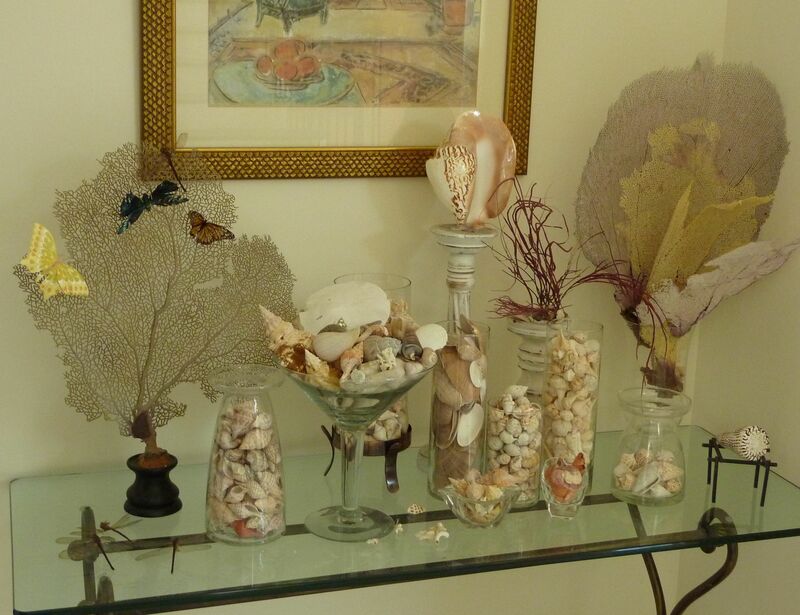 She puts her nicer shells in glass vessels and adds SEA FANS. Of course all of her best finds go into a special display, the Best Box. She adds shells to any shelf to make it feel like home. If she finds an olive shell without a tip, she keeps it to make olive garland for her chandeliers and Christmas tree. 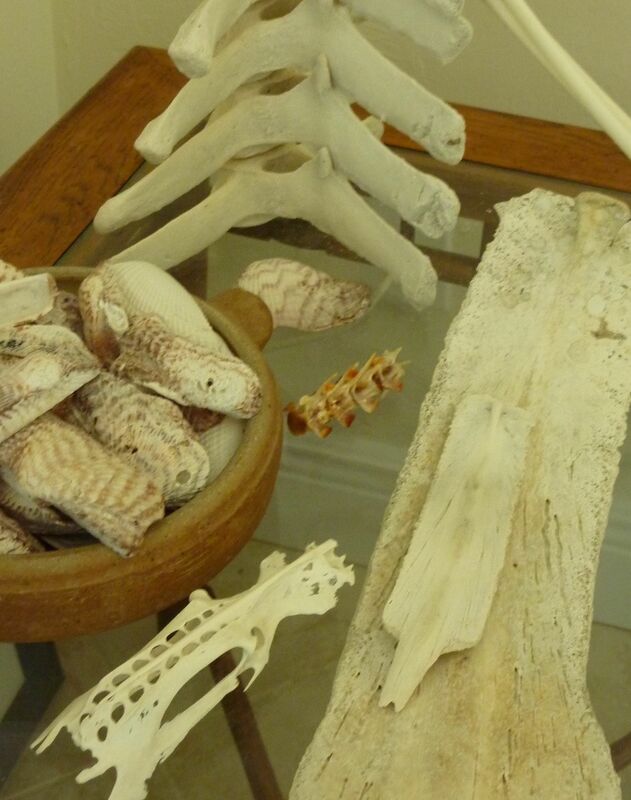 Her husband collects the unusual beach treasure while they walk on the beach. Bones of any type and TURKEY WINGS are his favorites. Whatever makes you happy, right? Hahaha No, really those bones are pretty cool. This is just a SMALL sampling of the art Jane creates. I havent even shown her frames. I’ll have to save those for another post. Here’s a sample…want more? Whoever Jane is, I love her! What great ways to use all of those treasures from the sea! I do want to know, however, how does she keep them from eventually getting encrusted with dust? Beautiful pieces of shell art! Great Ideas! I’ve been using some of my finds on some of my home decor that I sell on my website. These definitely top my shell art though! I imagine you can blow them out with canned air that is used on keyboards and computers. Just a guess. These are great! 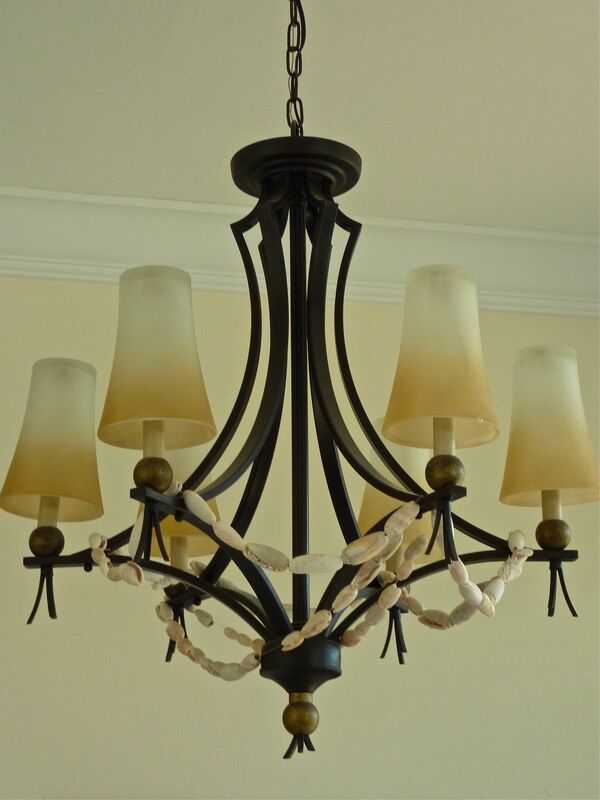 I love to display shells in my home too. I can’t wait to get back to Sanibel this weekend for more shelling!! Yes, please Pam, more pictures of Jane’s mirrors. 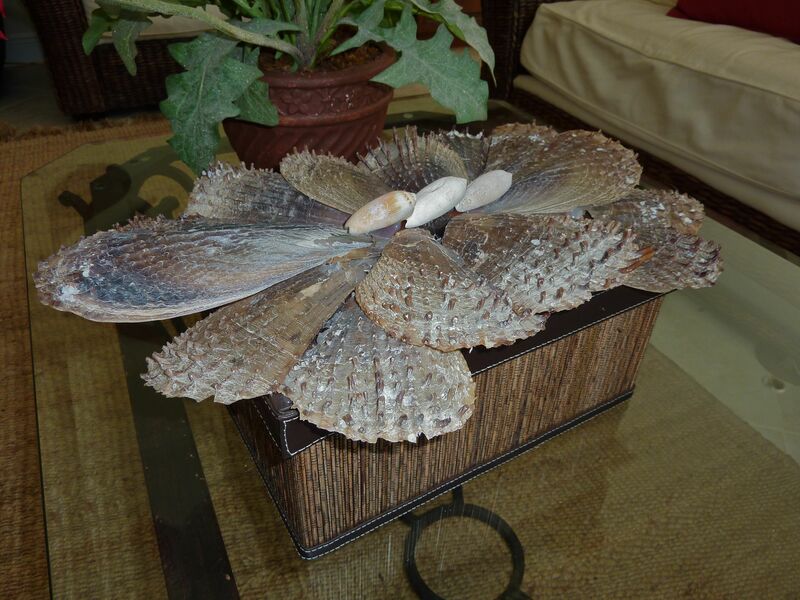 I also have made a mirror out of my “best shells”….and also picture frames to give as gifts. The pen shell box is fascinating- what a great idea, Jane! Thank you for sharing your treasures! I took my first trip to Captiva Island in June 1971, and gathered my first sea shells at that time. 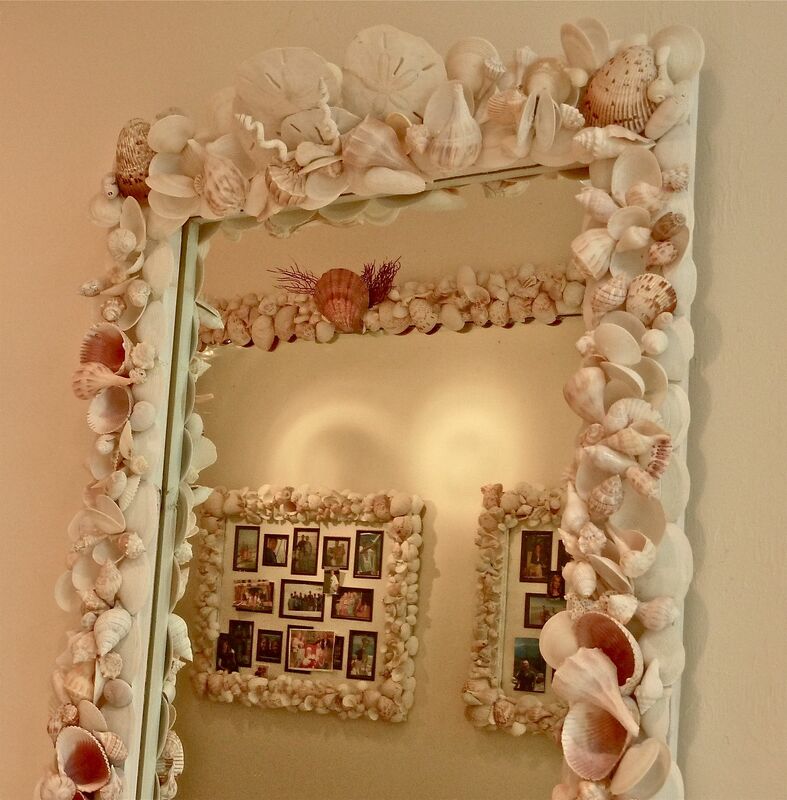 The next year I bought a mirror and an unembellished oval frame at She Sells Sea Shells on Sanibel, then I started gluing all my Captiva shells to the frame, and the mirror has hung next to my front door ever since. I’ve made hundreds of sea shell art pieces since 1971 and sell them to shell lovers when I can. 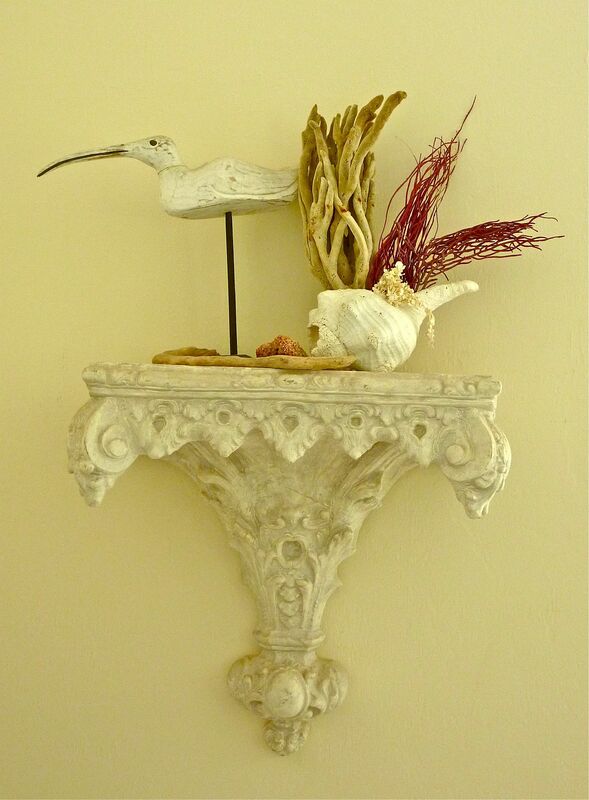 Like Jane, I am inspired to recycle bits and pieces of found items with my shells whenever I can. You just never know how something will come together, and I won’t put an art piece down until I finish it. 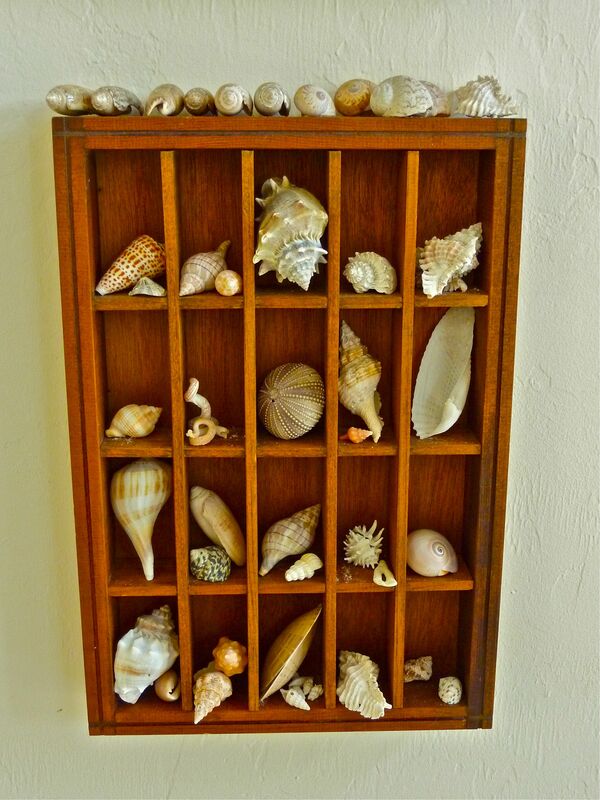 My Orlando home has a tropical theme, and I’m proud to display the shells I’ve collected on Sanibel and Captiva Islands. When I saw what Jane did with the pen shells, it reminded me of a trip I took to Sanibel shortly after 911. Someone had used pen shells, cockle shells, and other larger shells to create an American flag in the sand. That was the best use of sea shells I had ever seen. 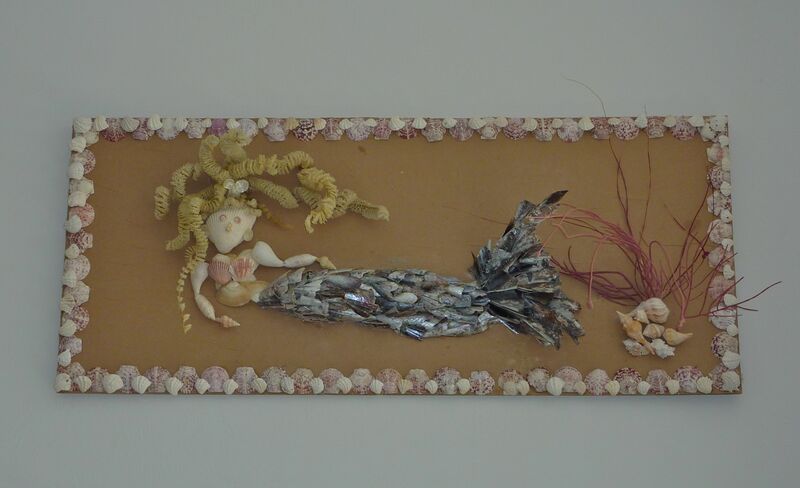 Keep creating, Jane, and keep sharing your beautiful sea shell art. 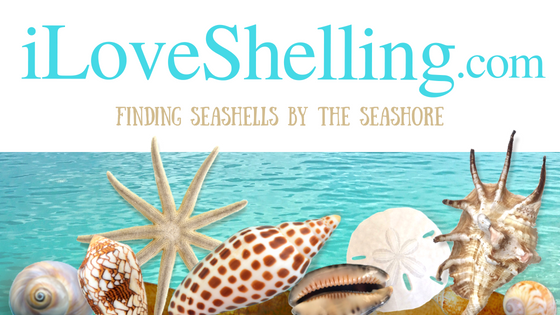 Nice site: Looking to get tips on shelling so I can get out there and do it. Great videos which helps the learning. I guess I need to mention the lighthouse pic which I need as my camera batt went bye-bye when our tour boat came near to it; so No good pic was optained! Hair dryer! That’s what I use. Of course, then the dust is all over the rest of the place, but at least my shells look good! Yes…please send more….I’ve been making gifts for family (60) members for the last couple of years and need more ideas!! All this is great…I can just see my house looking like that when we finally get to move down there!! Guess I should start now!! Thanks so much Pam for all you do and all your info….I’m ‘living the dream’ through you!! Hubby and I are coming to Sanibel Island for the first time on August. Does she have her frames/mirrors in any of the galleries where they can be purchase? Please take more photos of them. I’d love to see more. Also on your web site do you have a section on the proper way to shell? In the past I just walk up and down the beach. But in some of you videos I’ve seen different contraptions I didn’t know existed. Even some sort of rake and backhoe. We will be there 5 nites and I want to make the most of the shelling that I can. Instead of just figuring it out the last day. Awesome! Does Jane have a website?? Maya, she doesn’t have a website she just loves to create with shells. She just makes all of theses amazing pieces for her own home and for gifts for friends and family. I might have to persuade her to sell some of her work, right? No, she doesn’t sell any of her work…yet. I might persuade her. Check out my shelling tips under FAQs http://iloveshelling.com/blog/faqs/ . Good luck and remember, it’s a treasure hunt so enjoy the hunt as much as the finding. Jane’s designs and displays are both beautiful and inspiring!